On a warm, spring afternoon this is likely where you’ll find me. 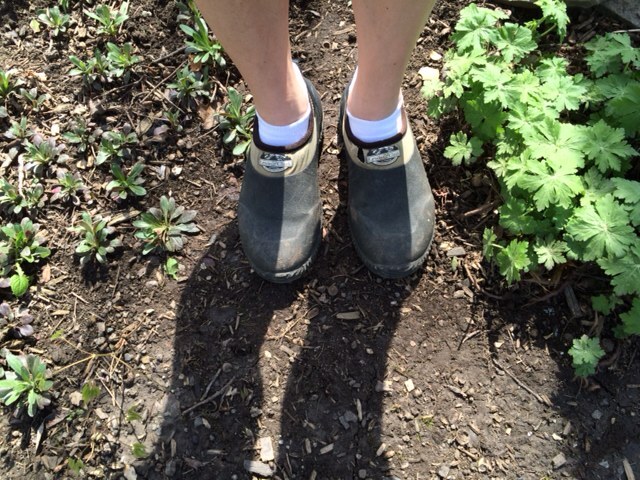 Somewhere amidst the peonies and the primrose, donning garden gloves with holes at the fingertips and tattered garden shoes on my feet. My wheelbarrow follows me around the yard like the dogs used to do, sitting next to me like a loyal friend. With our own two hands, my husband and I have planted every flower, bush and shrub that grows here. 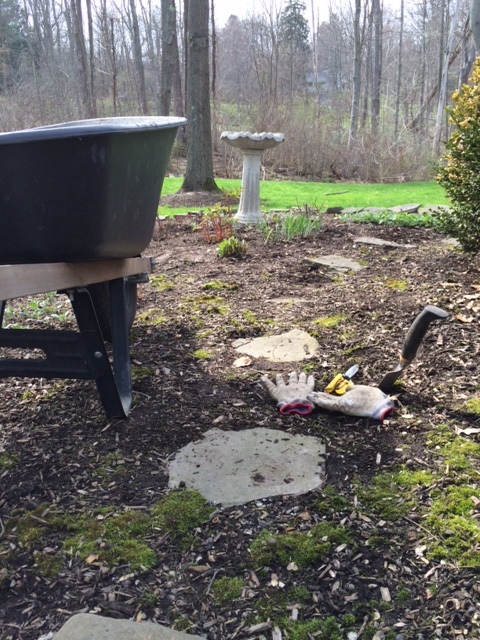 There’s not much to see yet this spring, but soon our perennial garden will be bursting with color and life. 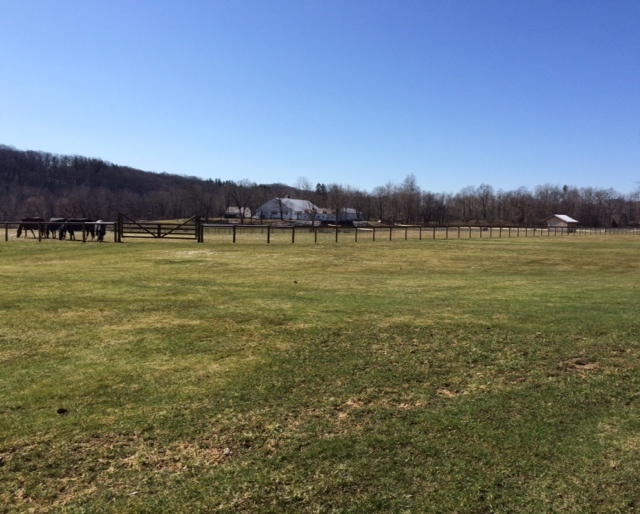 This past weekend was the first time this season that I was able to get out to begin preparing it for the summer. The first job each year is to clean up all the leaves, branches and debris that cluttered the beds over the fall and winter. We pull any weeds that have already begun sprouting up (there were plenty), and split, move or remove any plants that spread into unwanted areas. As I dug and raked I was reminded why I love this place. While it’s right out my door, the peace and quiet here feel worlds away from the noise and chaos that usually echo inside our walls. Like running, being here is therapeutic but in a very different way. Instead of loud music blaring through my headphones, nature’s music is all around me. Birds are calling to each other. This day, two Black Capped Chickadees sing their familiar mating call. “Fee Bee… Fee Bee.” At first there is just one. Then another begins to call back. In the beginning their songs are far apart in space and time, but gradually the calls get closer together. Soon they are singing simultaneously. “Sweet-ie” they seem to say. A few minutes later I can see them frolicking in the tree above me. I notice these sounds year round, but when I’m here in my garden, they are the music that literally keep me whistling while I work. 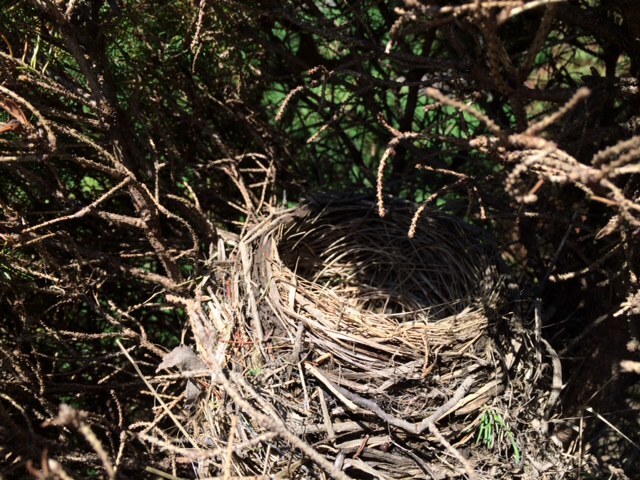 This day in my garden I came upon a freshly made Robin’s nest. She wasn’t home and neither were any eggs… yet. Don’t worry, I didn’t disturb her work. I stood for just a moment admiring her masterpiece, pleased that she was able to use some of the fountain grass I never got around to cutting back last fall. That’ll be my excuse for not doing it next fall too! How does she do it?! Pulling up weeds I find slugs and worms, “rolly pollies” and millipedes and I am reminded of a whole other world under the earth. I hold them in my hands and study them for a bit. I wondered how this tiny little slug and his army of friends, can do so much damage to my lovely flowers. I moved him and some others to the woods. I returned my worm friends back to their dark home in the dirt, thankful for the magic they perform in my garden. Did you know that worms help to increase the amount of air and water that gets into the soil? They break down organic matter, like leaves and grass into things that plants can use. When they eat, they leave behind castings that are a very valuable type of fertilizer. Another of God’s extraordinary creations. As I work my way around the beds, bringing order and tidiness to what was just littered with leaves and branches, I feel a sense of accomplishment. It reminds me of the order I’d like to bring inside my home, but can’t seem to accomplish with the kids undoing each of my tasks. Not here. This is my place. Their toys may be scattered around the driveway, but other than the relentless weeds, there is no clutter here. I know that soon these beds will be colorful and lush and I will walk down these stone paths that I placed here admiring God’s aromatic, rainbow of beauty. The pink Anemone, Bleeding Heart, and Peonies, the yellow Black-Eyed Susan and Evening Primrose, the purple Columbine, Spider Wort and Japanese Iris will each take their turn showing off their colors. I marvel at these gifts each year when they return, shaking off the bitter cold of winter, peaking up through the ground providing a beacon of hope that we’ve survived to the warmth of spring. As I work here I remember planting many of these flowers with my children by my side. Some with them as babies watching from the stroller alongside me. Others as young children eager to help dig a hole. This is our tiny piece of this extraordinary planet, where I become one with the earth on which our home is built and the nature that surrounds it. Not only is my garden full of beautiful, vibrant flowers that we planted as a family, it is full of lovely and colorful memories that bloom again in my mind with the arrival of each new spring. I have a tendency to spend my days focusing on what I should or want to ACCOMPLISH. Every day feels like a race against the clock to get things done; laundry, a workout, yard work, house work, hobbies. As a result, I subconsciously measure the success of my days by what I HAVE ACCOMPLISHED or by how many things I checked off my to-do list, which is usually not NEVER as much as I set out to. It is easy to see, therefore, why I often feel frustrated, agitated and discouraged by the end of most days. One day this week, I realized that very seldom do I focus on how I can ENJOY today, what I can LEARN or TEACH today or how I can SERVE God today. Turns out, when you build your day around these things instead of what you want to get done, a sort of transformation occurs in the way you approach life. Here is the story of how I made this discovery. I began this past Monday in typical school day fashion getting up early enough to pack lunches, cook breakfast, and coerce my kids away from the TV and into their clothes. I threw on some “workout clothes” because they are the easiest thing I can come up with in the five minutes I leave for myself. Out the door we rushed at 8:20 to drive my girls the five miles through town to school. After returning home to see the morning’s aftermath, I cleaned up breakfast, fed John another breakfast since he refused to eat his first, picked up the dirty diaper and PJs strewn about, made beds and walked past the toys and clutter. John watched cartoons while I did sit-ups on the floor, still sore from my race on Sunday. I began to map out in my head what else I needed to check off my to-do list. “Order birthday invitations, a few important phone calls, sign up for summer camps, laundry, errands, etc.” With temperatures expected in the 70s I hoped to spend most of the day outside. Working in the yard while watching John ride in his Cozy Coupe seemed like a perfect plan. Then as my two-year-old wandered around the house asking for gum, marshmallows and other “snacks” (not that the aforementioned count as snacks) every ten minutes or so, I began to realize that I was ignoring him. Sometimes he’s pretty good at entertaining himself if he needs to. Other times he gets into mischief rather quickly; climbing onto counters to find aforementioned marshmallows, coloring on couches, and putting on my make-up. I discovered that the times he gets into trouble are almost always when I am distracted and trying to get things done. I could see today was going to be one of those days and I felt guilty for all the times I made him keep himself busy. Sure it’s good for building his independence and flexibility, but he is only two. Without really thinking about what I was saying, “Put on your shoes,” were the next words to come out of my mouth. “Let’s go to the flower store and you can help me pick out some flowers to plant.” A little while later, we returned with our purple pansies and some other goodies from the garden center down the street. He helped me shovel the potting soil into the urns, taking a break to play with the new tractor he conned me into getting there. We transplanted the flowers into the pots and gave them a good drink of water before heading in to make a picnic lunch. I was pleased that I had accomplished something I wanted to do, while also including John. As I made him a plate of food, I thought about how much I enjoyed digging in the dirt with my little helper, even though I did most of the work plus a little extra to clean up the mess that he made. I reflected on how much more meaningful my yard projects are when the kids are helping me. Every time I walk by that pot of pansies, I will think of the day John and I planted them together. Just like every time I go by the plants we picked out together at our Amish friend Clara’s farm, I think about the adventure we took there and the day we planted our new treasures. I thought about how in just a couple of very short years John will be in Kindergarten all day and I will be here doing all these jobs on my own, with all the time, quiet and perfection I desire. That’s when I decided today wouldn’t be about my to-do list. It would be about me and John. So we laced up our old shoes and we headed across the street to one of our favorite escapes, the river! Down the trail we went. I carried him down a steep hill. We threw rocks, studied bugs, touched moss, and listened to the flow of the water and the wind. After awhile we hiked the trail even further where we followed horseshoe prints, stood on stumps and rocks and balanced on tree trunks. When his little legs grew tired we made the short walk home. We were hot and tired and we needed a cool treat. Popsicles fit the bill. As we waited for the girls to get home from school and I spent the next hour following John around the yard as he made new discoveries, I felt that familiar itch to start working on one of the many outdoor projects that were calling to me. Should I rake the leaves out of some beds? 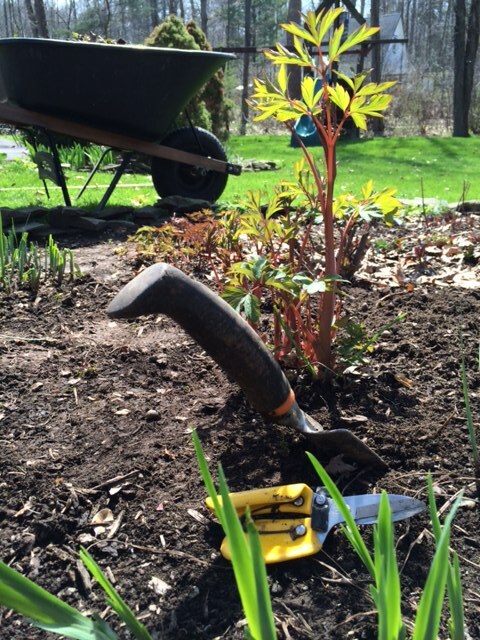 Dig up some bushes that didn’t do well over the winter? “No, Ashley. Play with your son.” I told myself. “The other stuff can wait. Never again will you have THIS perfect moment with him.” I thought about the sad story of a local family with three young children in which the father lost his life very unexpectedly this past weekend. That’s when it all came into focus for me. Life does not begin or become happier when everything is done and checked off your list. Your life is NOW. Right now. Stop putting so much emphasis on what you need TO GET DONE today or on what you want to ACCOMPLISH today. Take some time to focus on what you can ENJOY about today. Design part of your to-do list around what you can TEACH your children, yourself or others today. Try something new and challenge yourself to LEARN today. Stop telling yourself you’ll go play with your kids when the yard looks the way you imagine it. Quit saying that you’ll be happier after you get as fit as you’d like to be. Don’t miss out on adventure, memories and happiness that is right at your doorstep waiting for you to experience it because you are too busy trying to make things perfect. Because tomorrow there will be another to-do list nagging at you. Go to the river to throw rocks and ENJOY your little ones while they are little. TEACH yourself to sew or paint or fulfill a lifelong dream. Take a photo of something beautiful, reach out to an old friend, or do something that allows you to serve God today. Sure, we all have responsibilities and chores. But every so often, when you get the chance, choose your TO-ENJOY LIST over your TO-DO LIST. And remember, sometimes the days we feel like we have ACCOMPLISHED the LEAST are actually the days we’ve done the MOST. We’ve sung our babies to sleep, we’ve fed our families, or we’ve nurtured a sick child. We’ve loved and we’ve taught our children to do the same. Enjoy, teach, learn, love, TODAY. I can’t remember a time in my experiences as a parent when I’ve actually been fearful for my child’s well-being. Until today. Sure, we’ve been to the emergency room a time or two to tend to a grease burn or dehydration from the stomach flu. I’ve felt the pain in my own knee when my children have skinned theirs and I’ve hurt for my girls when I hear another kid say something hurtful to them. But I don’t recall experiencing a time where I was genuinely questioning whether or not my child was going to be ok, praying to God for help. Until today. I received a call from the nurse at Elizabeth’s elementary school right as I was finishing making a sandwich for myself and getting ready to sit down for lunch. She said my daughter had been in the office twice today and that she had no temperature, but she was crying and really didn’t seem to feel well. I told her I’d be there as quickly as I could. Worried because Elizabeth had just finished her Amoxicillin for pneumonia, I called the doctor’s office to try to get the earliest appointment I could. 4:20 was the best they could do. When I arrived at school Elizabeth looked ill, but there was nothing that was overly alarming to me. When we arrived home she agreed to try some soup. Once I got it in front of her, it wasn’t so appealing. She stared at it and hovered over it for awhile. Since she said her throat hurt I began offering her any soft food I could think of. Ice cream was the only thing she perked up for. So, ice cream for lunch it was. Hey, she was sick! And I know from experience with her getting dehydrated that any food or liquid when they are sick is better than nothing. Soon after, things changed quickly. She laid lethargic and motionless on the couch. Her skin began to look very pale, almost gray. Her eyes were missing their brightness and sparkle. She was quiet other than an occasional whimper and wheez. Her breathing was heavy, her head was hot and her heart was racing. At 1:30 my motherly instincts kicked in (or perhaps a greater power) and I decided we couldn’t wait until her 4:20 appointment. I carried her to the car in the blanket she was wrapped in. When we arrived at the doctor’s office, the women behind the desk could see why we were there. They know us well these days because we’ve been in so many times this school year with ear infections, strep throat, stomach flu and more. As we waited for the doctor to see her, I felt nervous and afraid. My worst fear was that the pneumonia she had been diagnosed with two weeks before had somehow gotten much worse and that the infection was taking over her body. I know from our family’s history that pneumonia can be deadly. I sat there with my arms wrapped around her praying for God’s help. I wasn’t sure why I was so emotional. Something about the situation just didn’t feel good. Was I being overdramatic? Maybe. 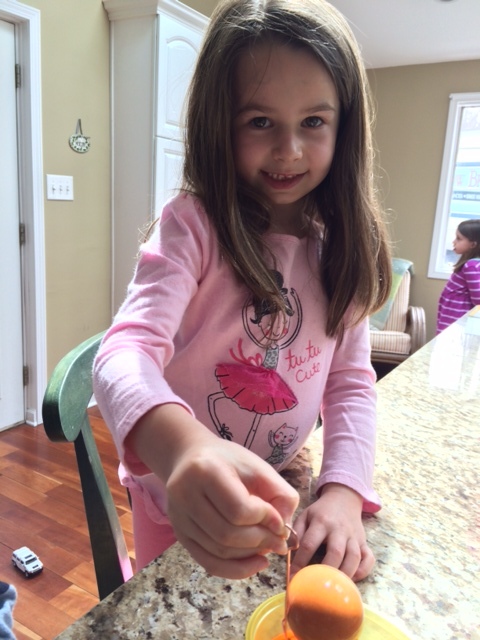 But at that moment, I was keenly aware that I had never seen my daughter look the way she did. Even through all the illness we’ve experienced this winter and in years past. I remembered how terribly sick I felt when I had pneumonia myself a few years ago. With her head resting on my shoulder I moved her to my lap. The wheezing in her chest was louder now. We sat for quite some time and I became impatient wondering how they could let us sit here so long when my baby was so sick. I wondered if I should have taken her to the ER instead, but after having paid for three ER visits during our bout with the stomach flu last month, I wasn’t eager to go back there quite yet. Besides, we were minutes from seeing a doctor now. She was uncomfortable so I moved her to the exam table where she laid down and began to close her eyes. This was unusual. Elizabeth never sits still. We have worked for years to train her to stay in bed in the mornings until 6:00 am, and she goes and goes and goes until bedtime and then still fights going to sleep. To see her lying on the exam table falling asleep confirmed for me just how sick she felt. Then the doctor walked in. “How are we doing?” he asked cheerfully. I paused and mumbled, “Not very well.” That’s when I lost control of my emotions and began crying while I spoke. I don’t even recall what I said next because I was trying to pull myself together so I didn’t make Elizabeth feel scared. I explained to him that she went from looking fine to labored breathing, fever, pale skin, motionless and very much not herself very quickly. My tears quickly communicated to him my concern. He and the med student who was with him immediately began listening to her lungs. They seemed concerned too. They completed their exam by watching her breathe for quite some time and listening to her lungs more and more. The doctors first words to me were, “So, her exam doesn’t look good.” I tried to act calm, but I was a wreck on the inside. He went on to say that he wanted us to get another X-ray to compare with the one she had a couple of weeks ago to see if the pneumonia had gotten worse or spread. First he wanted her to do another breathing treatment with Albuterol to help relax the muscles in the airways and increases air flow to the lungs. Within a couple of minutes, I could see a positive change in her. After another exam the doctor felt confident that Elizabeth’s condition was not a result of the pneumonia. He told us she was in a state of severe respiratory distress from inflammation in her lungs. Left untreated, it could have led to respiratory failure. She was having a sort of asthma attack most likely brought on by a virus that was exacerbated by the congestion already in her lungs from the pneumonia. We were still sent to get the X-ray to be certain. My husband joined us there. We went through the motions to get the X-ray and then went back to the doctor’s office. He was happy with the way her lungs looked from the pictures. He explained that we would take home with us a nebulizer, or a machine that would allow us to give her breathing treatments at home every six hours or so. She would need to take steroids for five days and they would give us an asthma inhaler to use when she was not at home to do the breathing treatments. Feeling relieved and watching Elizabeth look a little more like herself we headed home. Ever since, I’ve been thinking about what transpired. I am overjoyed that the pneumonia had not grown. I am thankful that Elizabeth’s condition wasn’t something worse. I am so very grateful that my prayers were answered and that she is going to be ok. And I’m so relieved that I followed my instincts and took my baby girl into the doctor’s office when I did. When the doctor told us that this condition could lead to respiratory failure if left untreated, I knew I made the right choice to get her in there as quickly as possible. Tonight I am also thinking of the families out there who are not so lucky. Whose children are faced with much more grave circumstances. I’m thinking of children fighting cancer and terminal illness while their parents hold vigil at their bedside. I am saying prayers for all of those families tonight. So often in my life, I forget how lucky I am that my biggest complaints are that I didn’t get my workout in today, that I didn’t get to check anything off my to-do list or that my kids bickering is getting on my nerves. Today, that feeling of fearfulness that I experienced was a wake-up call for me. As I was holding my baby’s hand in mine, worried that something was very wrong, I began kissing her and telling her how much I love her. Of course I tell her this often, but I realized quickly that it is still never enough. I felt guilty for shouting orders at her this morning rushing her along to get ready for school. If for some reason something were to get worse, I wanted “I love you” to be the last words she heard me say to her. While today’s events luckily turned out to be not as severe as I feared, I learned that I want to try harder to parent every moment as if it were the last. Today I was also reminded to follow my instincts. To listen to my head, my heart, my gut and my children. I am confident that sometimes the voice we hear inside of us is a power greater than us intervening and taking over guiding us down the right path. A month ago when we all had the stomach flu and Elizabeth couldn’t stop vomiting, my instincts told me she needed to go back to the ER. When Caroline said she wanted to come even though she hadn’t thrown up in 24 hours, my instincts told me to take her along. I did. She began vomiting in the hospital. Their tests revealed both were severely dehydrated and they hooked them both up to IV fluids. Two weeks ago when Elizabeth had been to the doctor and was told she didn’t have strep, but was not getting better after a couple of days, my instincts told me to take her back in. They did an X-Ray and they found the pneumonia. Almost every time my children have said they don’t feel well, and I think they are faking so they don’t have to go to school, when I finally take them to the doctor it always ends up being Strep, or an ear infection or pneumonia. I think I’ve finally learned these three words. Listen. Follow. Go. Listen to your heart. Follow your gut instincts. Go where they lead you. This past Saturday I ran 20 miles. The furthest I’ve ever run. I’m still in disbelief. A few short years ago I had never run more than a mile or two. 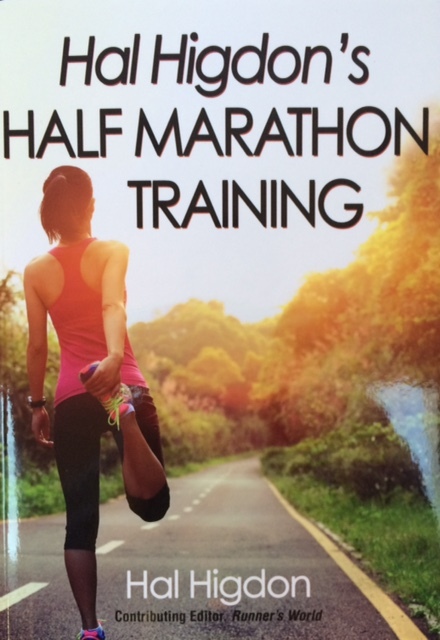 If someone had told me back then that I’d be training for a marathon in 2015 I would have said, “Yeah right! No way could I accomplish running that many miles (or even 5 for that matter).” Honestly, I wouldn’t even have had any desire to try. Running wasn’t my thing. 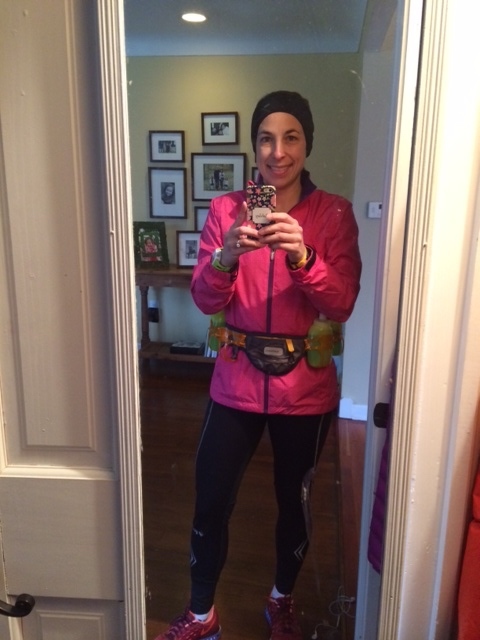 In my 10 Reasons Why I Run post I shared the story about how I began running and how it transitioned into running half marathons. This winter I decided I was ready for more. And so began the training for my first marathon. I spent the winter running through snow and bitter temperatures. When it was dangerously cold I moved inside where I logged 10 and 11 mile runs on the treadmill. Some might consider that a form of torture. 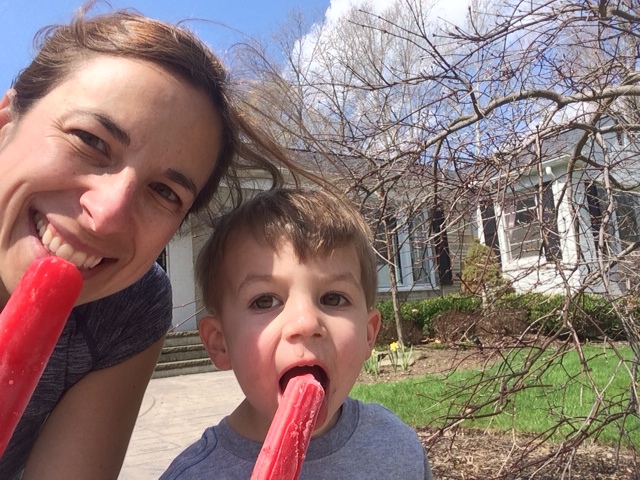 At times it seemed impossible that I would be able to fit in proper marathon training in between the responsibilities of my real job as a stay home mom. So far this year our household has been wrought with illness including the stomach flu, ear infections, colds, coughs and even pneumonia. Somehow I made it through to tell the story and was able to get in enough running to make it to the climax of my training, 20 miles. Today, I’m documenting here this longest run of mine so I can look back and remember the experience. Perhaps someone else might gain something too. Remember, I am no expert. Just an average mom and an average runner, trying to overcome the odds to fit in something for myself that makes me a happier person and a better parent. I set out early, about 8:00 am, on my favorite course which happens to be right out my doorstep and up my own street. I began with excitement in my veins, doubts in my head, butterflies in my belly and the “F” word on my lips. The air was cool (about 30 degrees) and the skies were gray. A small dusting of snow rested on the ground like it was frosted cereal and occasionally a gust of wind blew snowflakes into my face. I started off through the woods, past creeks and over bridges. Passing the first mile I realized I had begun too quickly. No way could I sustain my normal 8 minute pace for all 20 miles. I told myself to slow down so that I wouldn’t hit the wall at mile 15. Feeling good, I ran through the first four or five miles without much thought. I was singing, smiling and enjoying the moment. It’s funny how when I set out to run more than 10 miles the first few seem easy. Yet sometimes when I plan to run just 4 or 5 total, they seem so much harder. I reached the bottom of the biggest incline on the course, celebrated finishing 5 miles (the first quarter of the run) then powered to the top of the hill raising my arms to the sky and punching the air like I was Rocky. The clouds had begun to clear revealing a bright blue sky, my favorite music kept me singing out loud and I felt like I could run forever. 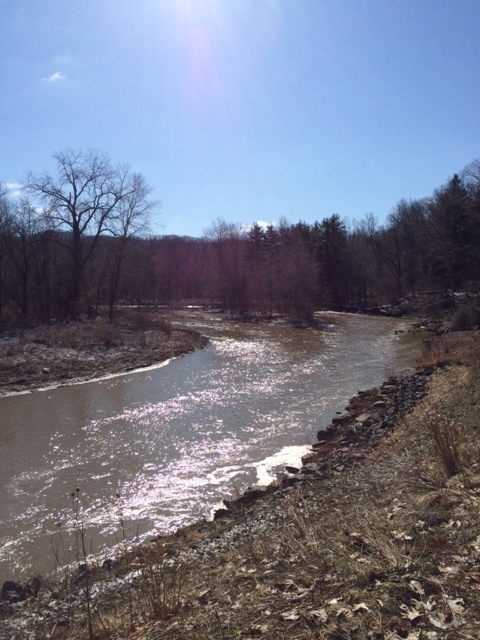 As I came down the other side of the big hill I caught my first glimpse of the Chagrin River on my right. It was raging from the heavy rain that fell over night. It’s energy was contagious. I followed it’s path another couple of miles glancing up at the rocky cliffs surrounding it. Navigating the curvy roads with no shoulder here was tricky. One careless car even sent me rushing off the road right into a big puddle. 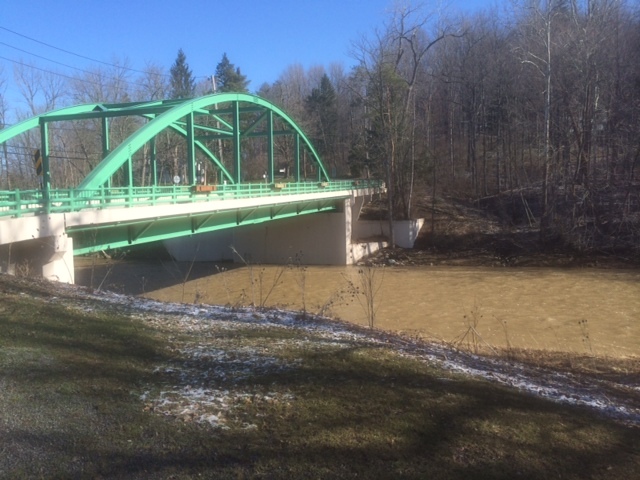 With wet shoes, I passed mile seven and crossed over the picturesque bridge in Gates Mills. This was the furthest point I’d ever run to on this road. “Three more to go until my half way point,” I thought. I continued to feel great until about mile nine when I kept looking at my watch hoping my turn around would come sooner. I began to feel really far from home and started to doubt whether I would actually be able to make it all the way back. Soon my watch beeped and blinked “10 Miles, 9:20.” I did a U-turn to begin the trek back and gave myself a mental pat on the back. I started to notice my legs and knees were beginning to feel sore and tired. I tried to refocus my attention on something else, so I started to think about how badly I needed to find a bathroom. It was the perfect distraction. The location of the Gates Mills library couldn’t have been more perfect. At about 13 miles I popped in and used it as a chance to quickly refill my water bottles and stretch my legs for a few seconds. I set back out with seven miles to go. That didn’t seem like a lot compared to the 13 I’d already run, but envisioning all the road that lie between me and home seemed overwhelming. I set my sights on completing the next two miles bringing me to 15, three quarters of the way through the run. Before climbing to the summit of that tallest hill once again, I stopped for a moment to admire the river glistening in the sun. “Come on Ashley,” I said out loud. With five miles left my feet were throbbing from my bunions and calluses. My knees were sore and my quadriceps were beginning to cramp up. Running down some small slopes exacerbated the pain. I reached a low, flat spot we call “death valley” because in the summer it gets really hot. Just when I needed it most I saw a familiar car approaching. My in-laws had come to check on me with all three of my kids in the back seat. They turned around and drove alongside me for a bit asking if I could make it home. The kids’ smiling faces helped me perk up and carried me through the next mile. I reached the top of the hill bringing me out of the valley and to one of my favorite spots, the horse farm where I always look forward to seeing the animals grazing. I paused long enough to capture a photo and then waved good-bye to the horses. I felt like a snail. I turned on my standby playlist with all my favorite songs that motivate me the most. As much as I wanted to walk, I kept running. With two miles left it felt like there were knives scraping the balls of my feet. My knees were throbbing and my legs were tight and firey. With just a mile and a half or so left, I stopped to walk for about 20 yards, but somehow walking was not easier. I began running again and soon was just one mile from home. I wasn’t sure whether to celebrate or cry. I kept going. As cars passed me, my once enthusiastic wave or smile to say “thank you” were no longer present. I began counting electrical poles and setting short goals like the pine tree ten feet ahead or the next road sign. With a half mile to go I knew I could do it. Soon I could see my neighbors’ driveway and then my own. I climbed the last hill with pain in my body, tears in my eyes, words of praise on my lips and pride and gratitude in my soul. This morning’s journey that began with excitement, doubt and butterflies ended with praise, pride and gratitude. It took a little more than three hours, but it was really a journey over three years. Three years of hard work, dedication and self discovery. Three years ago my goal was to complete two or three miles, then 5.25 in my first race, then my first 10K. I accomplished “the impossible” when I ran my first half marathon in the fall of 2013. On Saturday I accomplished “the impossible” again as I completed my longest run to date. I am confident that I will meet my goal on April 26th and finish the Big Sur Marathon. But if I don’t, it’s ok. Because in so many ways, I have already met my goal. I don’t need a finish line and a medal to prove anything. I have already proven to MYSELF that no matter how difficult the challenge in life, even one that seems impossible to me, I can persevere. I am capable of more than even I thought possible. Through pain, doubt, and tears, I’ve run. I’ve conquered steep hills, frigid temperatures and uncomfortable distances. If I can get through those struggles, I’m prepared to power through any challenge life throws at me. Through running that idea has transcended the way I live my life. It helps me live life to the fullest, not afraid to try new things or take on new challenges. This average mother of three who can’t manage to get the laundry folded, has managed to conquer her fear and accomplish something she never thought possible. I discovered a love of something I had never even tried until I was 35, causing me to broaden my horizons. I began running in 2012 to help me LOSE baby weight. Back then I didn’t realize that running is actually more about what you GAIN; confidence, faith, love, happiness, strength, focus, and so much more. YOU too are capable of more than you realize. YOU can do anything you set your mind to. Whether your goal is a half marathon, a 5K or just running down your street and back, you can do it! Whether it’s an athletic goal, a career goal or a personal goal, you can accomplish virtually anything you can dream. But you will never know if you never try. Dying eggs for Easter. It’s one of those holiday traditions that sounds really special, but usually turns rotten pretty quickly. The kids are always excited about it and so am I, but I also secretly dread it a little bit. Is that bad? It’s right up there with carving pumpkins and decorating Christmas cookies. When you think back to doing such activities as a kid, they have a sort of magical nature about them. And then as an adult before you have kids, you dream about doing them with your own family someday. 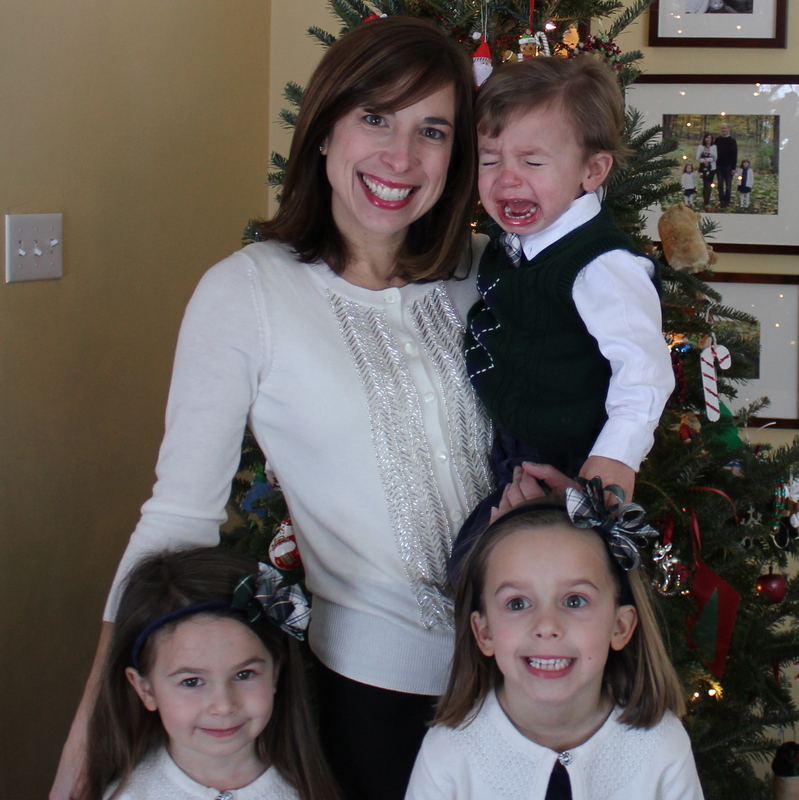 Sadly, for me, the reality of orchestrating these activities as a mom has lost its luster. They all sound like special opportunities to make beautiful holiday memories, but typically end with mom and dad doing all the work while the kids complain. Let me paint a picture for you (or an egg, as it were). Here’s how it usually unfolds at our house. 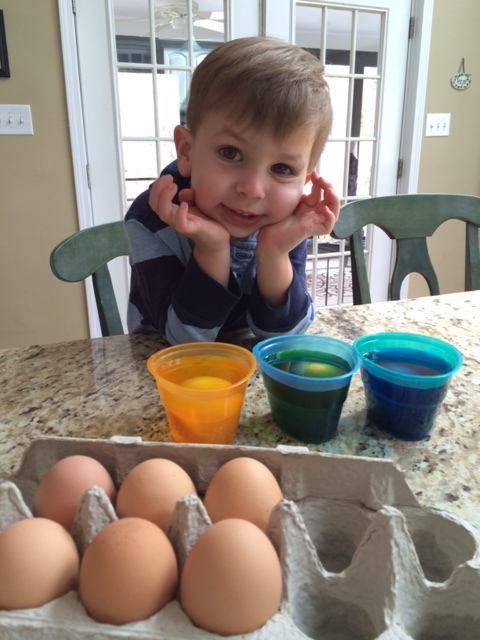 1) Kids ask incessantly about WHEN we can DYE EGGS??!! And ask and ask and ask. And beg. I put it off as long as possible because I know how it’s going to go. 2) I quickly look through my Pinterest Easter page at all the glittery, gorgeous masterpiece egg decorating ideas I pinned. I realize I don’t have any of the materials needed to create a single one of them, again. Nor do I have the patience to undertake them. So I decide to just use the boring old box of dye and stickers I bought as backup. 3) I finally agree to get started and put the dye tablets in the water and vinegar. And wait and wait and wait. 4) The kids complain that it’s taking too long for the tablets to dissolve and ask repeatedly if they are ready. “Are they ready yet?” Not yet. “Can we start now?” Almost. “Why is it taking SOOOO long? ?” Just be PATIENT! 5) The water and dye is finally ready! I set out all the bowls of colorful water and the kids begin to fight over who gets to use which color first. 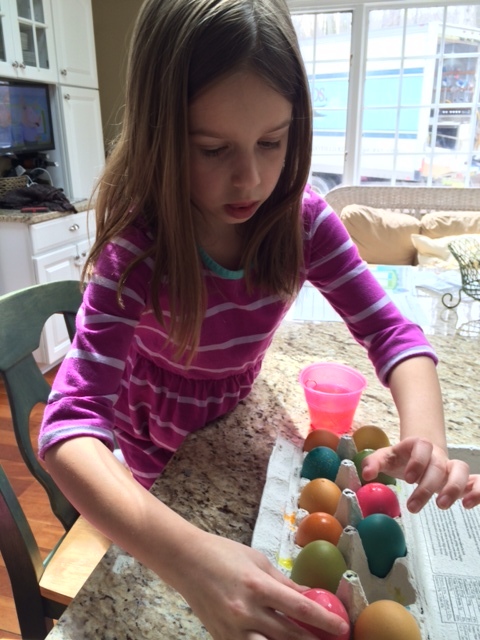 They eventually each put an egg in a couple of different colors. 7) One child becomes impatient because they want to use the yellow, but another child is “taking too long” with the yellow. 8) Kids begin complaining that “this is BORING” and leave the room to do something else. 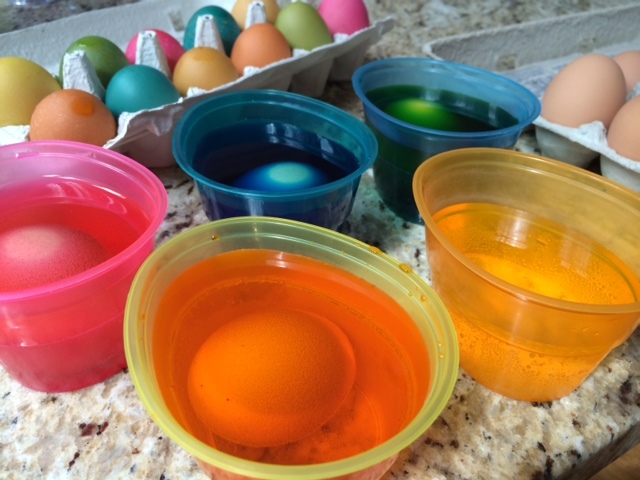 10) I tell myself that next year I will plan ahead and come up with some REALLY clever Easter egg decorating activity and that my kids will be so wowed by it’s awesomeness that they will LOVE every second of it and not complain. Normally at the end of my posts I share some silver lining or some important lesson I learned about life from my experiences. But this time the lesson I learned is quite simple. In the future I plan to do all Easter egg decorating, pumpkin carving and cookie decorating in the evening so it can involve WINE for MOMMY and it will be fun for EVERYONE! P.S. 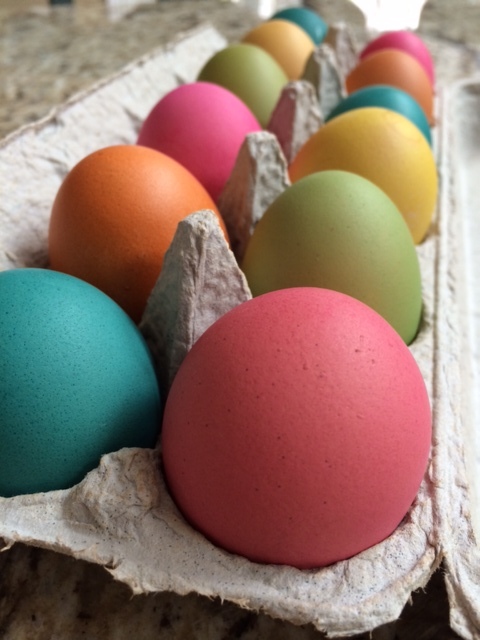 By the way, if you ever wondered if you can dye brown organic eggs, the answer is yes! This is the first time we tried it. The colors turn out quite bright and lovely.